The Village is a 2004 American psychological thriller mystery drama film, written, produced, and directed by M. Night Shyamalan, and starring Joaquin Phoenix, Adrien Brody, Bryce Dallas Howard, William Hurt, Sigourney Weaver, and Brendan Gleeson. The film is about a village whose population lives in fear of creatures inhabiting the woods beyond it, referred to as "Those We Don't Speak Of". Like other films written and directed by Shyamalan from the same time period, The Village has a twist ending. The film received mixed reviews, with critics especially divided about the plausibility and payoff of the ending. The film gave composer James Newton Howard his fourth Academy Award nomination for Best Original Score. Residents of the small, isolated, 19th-century Pennsylvania village of Covington live in fear of nameless humanoid creatures in the surrounding woods and have constructed a large barrier of oil lanterns and watch towers that are constantly staffed to keep watch. After the funeral of a seven-year-old boy, Lucius Hunt (Joaquin Phoenix) asks the village elders for permission to pass through the woods to get medical supplies from neighboring towns. However, his request is denied. Later, his mother Alice (Sigourney Weaver) scolds him for wanting to visit the neighboring towns, which the villagers describe as wicked. The Elders also appear to have secrets of their own and keep physical mementos hidden in black boxes, the contents of which are supposedly reminders of the evil and tragedy they left behind when they left the towns. After Lucius makes a short venture into the woods, the creatures leave warnings in the form of splashes of red paint on all the villagers' doors. Ivy Elizabeth Walker (Bryce Dallas Howard), the blind daughter of the chief Elder Edward Walker (William Hurt), informs Lucius that she has strong feelings for him and he returns her affections. They arrange to be married, but Noah Percy (Adrien Brody), a young man with an apparent developmental and learning disability, stabs Lucius with a knife, because he is in love with Ivy himself. Noah is locked in a room until a decision is made about his fate. Edward goes against the wishes of the other Elders, agreeing to let Ivy pass through the forest and seek medicine for Lucius. Before she leaves, Edward explains that the creatures inhabiting the woods are actually members of their own community wearing costumes and have continued the legend of monsters in an effort to frighten and deter others from attempting to leave Covington. He also explains that the costumes are based upon tales of real creatures who once lived in the woods. Ivy and two young men are sent into the forest, but both protectors abandon Ivy almost immediately, believing the creatures will kill them, but will spare her out of pity. While traveling through the forest, one of the creatures suddenly attacks Ivy. She tricks it into falling into a deep hole to its death. However, the creature is actually Noah wearing one of the costumes, which he discovered under the floorboards of the room where he had been confined after stabbing Lucius. Ivy eventually finds her way to the far edge of the woods, where she encounters a high, ivy-covered wall. After she climbs over the wall, a park ranger named Kevin (Charlie Hofheimer) spots Ivy and is shocked to hear that she has come out of the woods. The woods are actually the Walker Wildlife Preserve, named for Ivy's family, and it is actually the modern era instead of the 19th century as the villagers allege. Ivy asks for help and gives Kevin a list of medicines that she must acquire, also giving him a golden pocket watch as payment. During this time, it is revealed that the village was actually founded in the late 1970s. Edward Walker, then a professor of American history at the University of Pennsylvania, approached other people he met at a grief counseling clinic following the murder of his father and asked them to join him in creating a place where they would sustain themselves and be protected from any aspect of the outside world. When they agreed, Covington was built in the middle of a wildlife preserve purchased with Edward's family fortune. The head park ranger (M. Night Shyamalan) tells Kevin that the Walker Estate pays the government to keep the entire wildlife preserve beneath a no-fly zone and also funds the ranger corps who ensure no outside force disrupts the preserve. Kevin retrieves the requested medicine from his ranger station and Ivy returns to the village with the supplies, left unaware of the truth of the situation. During her absence, the Elders secretly open their black boxes, each containing mementos from their lives in the outside world, including items related to their past traumas. The Elders gather around Lucius's bed when one of the townsfolk informs them that Ivy has returned and that she killed one of the monsters. Edward points out to Noah's grieving mother that his death will allow them to continue deceiving the rest of the villagers that there are creatures in the woods, and all the Elders take a vote to continue living in the village as they have been. Ivy comes in and tells Lucius that she has returned. The film was originally titled The Woods, but the name was changed because a film in production by director Lucky McKee, The Woods (2006), already had that title. Like other Shyamalan productions, this film had high levels of secrecy surrounding it, to protect the expected twist ending that was a known Shyamalan trademark. Despite that, the script was stolen over a year before the film was released, prompting many "pre-reviews" of the film on several Internet film sites and much fan speculation about plot details. The village seen in the film was built in its entirety in one field outside Chadds Ford, Pennsylvania. An adjacent field contained an on-location temporary sound stage. Production on the film started in October 2003, with delays because some scenes needing fall foliage could not be shot because of a late fall season. Principal photography was wrapped up in mid-December of that year. In April and May 2004, several of the lead actors were called back to the set. Reports noted that this seemed to have something to do with a change to the film's ending, and, in fact, the film's final ending differs from the ending in a stolen version of the script that surfaced a year earlier; in the original version, the film ends after Ivy climbs over the wall and it is revealed to the audience that the film takes place in the present day. The Village polarized critics. It earned a "rotten" certification at Rotten Tomatoes with only 44% giving it a positive appraisal, based on 215 reviews and an average score of 5.4/10. The consensus reads, "The Village is appropriately creepy, but Shyamalan's signature twist ending disappoints." At Metacritic, the film holds a score of 44 out of 100, based on 40 reviews, indicating "mixed or average reviews". Roger Ebert gave the film one star and wrote: "The Village is a colossal miscalculation, a movie based on a premise that cannot support it, a premise so transparent it would be laughable were the movie not so deadly solemn ... To call the ending an anticlimax would be an insult not only to climaxes but to prefixes. It's a crummy secret, about one step up the ladder of narrative originality from It was all a dream. It's so witless, in fact, that when we do discover the secret, we want to rewind the film so we don't know the secret anymore." The film is listed on Ebert's "Most Hated" list. There were also comments that the film, while raising questions about conformity in a time of "evil," did little to "confront" those themes. Slate's Michael Agger commented that Shyamalan was continuing in a pattern of making "sealed-off movies that [fall] apart when exposed to outside logic." The movie had a number of admirers. Critic Jeffrey Westhoff commented that though the film had its shortcomings, these did not necessarily render it a bad movie, and that "Shyamalan's orchestration of mood and terror is as adroit as ever". Philip Horne of The Daily Telegraph in a later review noted "this exquisitely crafted allegory of American soul-searching seems to have been widely misunderstood". The soundtrack by Howard has also been widely praised, and was nominated by the American Film Institute as one of the Best Film Scores and the Academy Award for Best Original Score. A parody version of the film is featured in Scary Movie 4. Simon & Schuster, publishers of the 1995 young adult book Running Out of Time by Margaret Peterson Haddix, claimed that the film had taken ideas from the book. The book had a plot which features a village whose inhabitants are secretly forced to live in the 1830s when the year is actually 1996. The plot of Shyamalan's movie had several similarities to the book. They both involve a village, which is actually a park in the present day (Shyamalan uses a late nineteenth-century village), have young heroines on a search for medical supplies, and both have adult leaders bent on keeping the children in their village from discovering the truth. In Haddix's novel, the truth is that the village is a tourist attraction; in the movie, that the adults had decided to withdraw from the outside world. No lawsuit was ever filed over the similarity. The film grossed $114 million in the U.S., and $142 million in international markets. Its worldwide box office totalled $256 million, the tenth highest grossing PG-13 movie of 2004. The film was released on VHS and DVD on January 11, 2005. This is currently the only M. Night Shyamalan film that does not have a Blu-ray version. 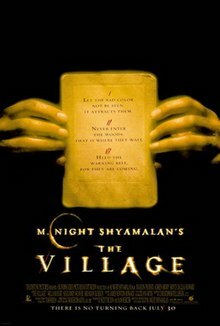 The Village was also the last Shyamalan film to be released on VHS. Nominated - Choice Movie Scary Scene — Bryce Dallas Howard, Ivy Walker waits at the door for Lucius Hunt. The film's score was composed by James Newton Howard, and features solo violinist Hilary Hahn. The film was nominated for the Academy Award for Best Original Score, but lost to Finding Neverland. "What Are You Asking Me?" "Those We Don't Speak Of"
"I Cannot See His Color"
"The Shed Not to Be Used"
^ "The Village (12A)". British Board of Film Classification. July 26, 2004. Retrieved August 1, 2016. ^ a b c "The Village (2004)". Box Office Mojo. ^ a b "Village, The (2004): Reviews". Metacritic. CNET Networks, Inc. Retrieved June 5, 2010. ^ a b "Village, The (2004) Movie Reviews". Rotten Tomatoes. IGN Entertainment, Inc. Retrieved November 20, 2018. ^ "Pre-review of ''The Village''". Webcitation.org. Archived from the original on October 26, 2009. Retrieved March 12, 2013. ^ "Pre-review of ''The Village'' at". Horrorlair.com. February 18, 2007. Retrieved March 12, 2013. ^ IMdb.com - FAQ for The Village "Where exactly was the movie filmed? Did they use historical buildings or did they build everything?" ^ "Change to ending of ''The Village''". Comingsoon.net. Retrieved March 12, 2013. ^ "More views of ''The Village'' – aerial". Webcitation.org. Archived from the original on October 26, 2009. Retrieved March 12, 2013. ^ "The Village Script - Dialogue Transcript". Script-o-rama.com. Retrieved March 12, 2013. ^ "Ebert's Most Hated". Rogerebert.suntimes.com. Retrieved March 12, 2013. ^ "The Reel Deal: ''The Village''". Oregonherald.com. March 16, 2012. Archived from the original on January 6, 2014. Retrieved March 12, 2013. ^ Yglesias, Matthew. "Village Idiot". Slate.com. Retrieved March 12, 2013. ^ "telegraph.co.uk". telegraph.co.uk. Retrieved March 12, 2013. ^ "HollywoodBowlBallot" (PDF). Retrieved March 12, 2013. ^ "Stolen idea in ''The Village?''". Film.guardian.co.uk. August 10, 2004. Retrieved March 12, 2013. ^ Kamberg, Mary-Lane (December 15, 2013). Margaret Peterson Haddix. Rosen Publishing Group. pp. 41–42. ISBN 9781477717721. Retrieved March 10, 2016. ^ "AFI's 100 Years of Film Scores Nominees" (PDF). Retrieved August 6, 2016. Wikimedia Commons has media related to The Village (film). American Cinematographer Magazine, August 2004. Interview with Roger Deakins on The Village's cinematography. "Disney and Shyamalan in your back yard" - Website by a local resident describing the filming of The Village in Chadds Ford, Pennsylvania.